5 Facts You May Not Have Known About Your Air Conditioner | Balanced Air, Inc.
Is a Heat Pump Less Powerful at Cooling Than an AC? This is an important fact to know because if you do see ice forming on the air conditioner, it means something is wrong. 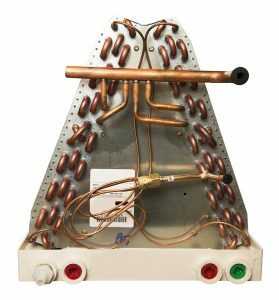 Ice only occurs if the evaporator coils aren’t able to absorb sufficient heat to warm up the refrigerant moving through them. If you look at the cabinet of your air conditioner, you’ll see its SEER rating. This tells you how well the system converts electrical power to cooling power. The higher the number, the more efficient the AC. For a cooling system to earn the ENERGY STAR label from the US Department of Energy, it must have a SEER of at least 15. Many units have a SEER of 20 or more. When the evaporator coil in the air conditioner (the indoor coil) removes heat from the air, it also draws out moisture, which condenses along the coil and then drips down into a pan. This means the AC has some dehumidifying properties. However, if humidity is a serious problem in your home, you’ll need a dedicated dehumidifier to deal with it—the AC won’t be enough. For decades, the refrigerant in residential air conditioners was a chemical blend known as R-22. Because R-22 causes ozone depletion, it has been gradually phased out. Current air conditioners use R-410A refrigerant (a.k.a. “Puron”). As of next year, all use of R-22 will be phased out and older air conditioners that still use it won’t be able to be repaired. Need air conditioning service this spring or summer? Balanced Air, Inc. has served the Tampa Bay Area Since 1988.